LATEST: The fire that burnt Gatton's Imperial Hotel to the ground this morning could have been far worse according to Lockyer Valley Mayor, Steve Jones, but for the quick response of the local fire brigade. 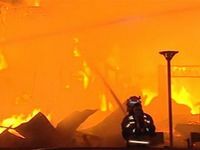 Mayor Jones said it is an extraordinary effort by the fire service to respond so quickly and that quick response potentially saved half of the western side of Gatton's main street from being engulfed. After the first 000 call was made Mayor Jones said the local fire officers were on the scene battling the blaze within eight minutes. "This morning I heard some ridiculous comments made in the media about the fire siren not going off which is extremely disappointing. The response was exceptional regardless of the siren," he said. "The siren was originally designed in a time when we didn't have mobile phones and pagers etc. Gatton fire as it happened: Krystal Raddatz was one of the first people on the scene at the Imperial Hotel fire in Gatton on Wednesday night. She filmed the blaze. "These days the fire service has access to some of the most up-to-date technology and that was evident last night." Mayor Jones said council would have to go back to basics in terms of helping with the clean-up. "We are waiting on the structural engineers recommendations and that will need to be discussed with the owners. "We need to have the owners involved as well, their insurance companies as well. That's not as easy as it sounds, because a building that old would have had asbestos in it." The owner of the Imperial Hotel, Eskander Alokaily, refused to comment to media, but it has been confirmed that he is in fact has business insurance. UPDATE: Investigators will this morning attend the scene of a fire which destroyed a hotel in Gatton overnight. Emergency services were called to Railway Street around 12.45am following reports that a building was on fire. The double-story building was destroyed and adjoining buildings sustained water and smoke damage during the fire. Investigations into the cause of the fire will continue throughout the day. 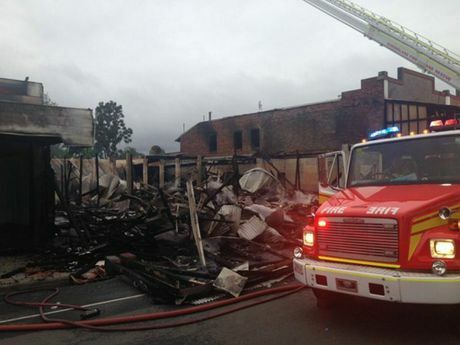 6AM: A large blaze has destroyed an historic hotel and damaged several other businesses at Gatton overnight. Emergency services report that the Imperial Hotel in the town's centre caught fire just before 1am. Fire crews from surrounding areas, including Ipswich, were called in, but the building was well alight and had already partially collapsed before their arrival. Police believe the hotel was unoccupied at the time of the fire. Other shops including a Super Cheap Auto and an IGA supermarket on Railway Terrace also sustained some damaged. A number of firefighters have also been treated for heat exhaustion. Police are urging residents to avoid Railway Street, North Street, Crescent Street and Wiggns Street.